Written by Francesca R. Jensenius. It is well known that women are under-represented in India’s legislative assemblies. The historically marginalised Scheduled Castes (SCs) and Scheduled Tribes (STs), on the other hand, have reserved seats proportional to their share of the population that guarantee them a political presence. What does this mean for SC and ST women? Perhaps counter-intuitively, the answer is that there are more women candidates and winners in reserved seats than in general category seats. Gearing up to the 2019 general elections, a fair amount of attention is being paid to the number of women being nominated as candidates by the different political parties. The Chief Minister of Odisha, Naveen Patnaik, has pledged that his party will nominate at least one-third women in this election, and West Bengal’s female Chief Minister, Mamata Banerjee of the Trinamool Congress, has fielded 41 per cent female candidates. The dominant parties BJP and Congress lag behind, having so far fielded only 12 and 14 per cent female candidates, respectively. It is about time that some of the parties started fielding more women. The number of women in India’s legislative assemblies has increased at a painfully slow rate. In India’s first parliaments in the 1950s, there were about 4.5 per cent elected women. This increased to 6.3 per cent in the 1962 elections (as shown in Figure 1) but the number then dropped to 5.8 per cent in 1967 and to 3.5 per cent in 1977. Since then, there has been a very gradual increase in the number of elected women – with the exception of the 1984 elections, when an unprecedented number of female candidates from the Congress party were elected following the assassination of Indira Gandhi. The percentage of elected women crossed the 10 per cent mark in the 2009 elections, and then climbed to the unimpressive level of 11.4 per cent in the 2014 elections. 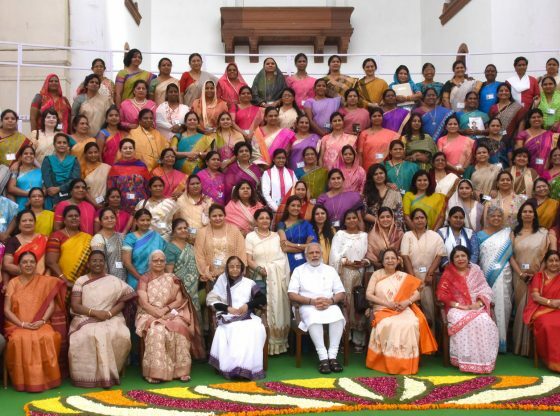 With another few women winning by-elections between 2014 and 2019, the current number of female Members of Parliament (MPs) is 66, placing India at number 149 out of 193 countries in terms of women’s representation in parliament. The number of female candidates (as opposed to those being elected) has consistently been even lower; from 1962 all the way through to the 1998 election there were only about 3 per cent women among the candidates running for elections. Breaking the numbers down by party, it is clear that the Congress party has generally fielded more women than other parties, while the Bharatiya Janata Party (BJP) and other parties only started to catch up in the late 1990s. The increase in the number of female candidates between the 1996 and 1998 elections occurred after the introduction of the Women’s Reservation Bill in parliament in 1996. This bill proposed that one-third of the seats in India’s legislative assemblies should be reserved for women. All the major parties publicly supported the idea of increasing the percentage of elected women in politics, but the bill was not passed. In this light, the increase in female candidates in the 1998 elections from 3.2 per cent to 5.8 per cent was underwhelming. In the state assembly elections, the percentage of women running for or winning office is even lower. Here, the share of women candidates and winners remains below 10 per cent. This is in stark contrast with local-level politics, where women – because of reservations – hold at least one-third of the elected positions. A common concern in discussions about increasing the presence of both women and minorities in elected politics worldwide is that it is difficult to include minority women. Reservations or other quota policies that have been designed to include minorities in politics often result in the election of minority-group men, while quotas for women often result in the election of majority-group women. Minority-group women, who are doubly disadvantaged, often end up falling between the cracks of the institutional efforts to make political institutions more diverse. In local-level politics in India this is not a concern, since there are quotas in place not only for women but also for SCs, STs and for Other Backward Classes (OBCs). Positions are therefore specifically reserved for SC, ST and OBC women. But does the same apply at the state and national levels? Here there are quotas in place for SCs and STs in proportion to their share of the population, but not for women. Interestingly, SC and ST women have actually fared better than general-category women in terms of both party nominations and winning seats. Figure 2 shows the percentage of female candidates in non-reserved (general) and SC- and ST-reserved constituencies between 1962 and 2014. Consistent with the pattern shown in Figure 1, up until the 1990s, the percentage was low across all types of constituencies, although somewhat higher in the ST-reserved constituencies. 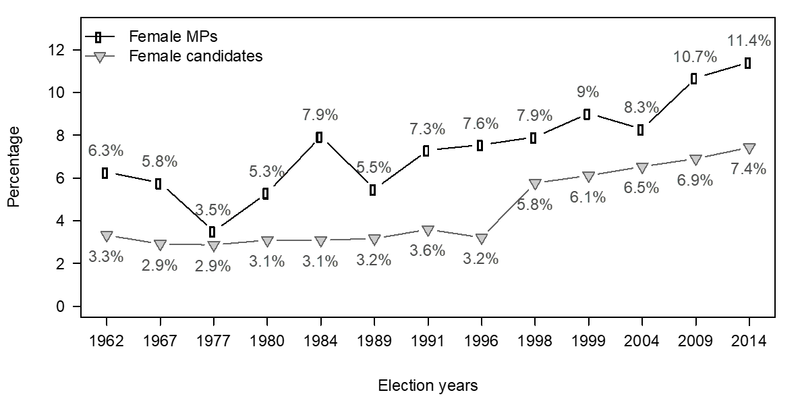 Since 1991, however, the share of women in reserved constituencies has consistently been somewhat higher. Looking at data from state assembly elections, the pattern is even starker: here it seems clear that much of the increase in the nominations of female candidates in recent years has actually taken place in reserved constituencies. The difference in nomination patterns is also reflected in how many women have won elections. In 2014, for instance, 11 per cent of MPs elected in general-category constituencies were women, compared to 14 per cent of MPs from SC-reserved constituencies and 13 per cent of MPs from ST-reserved constituencies – it is actually the general-category women who have drawn the shortest straw in Indian elections so far. There may be several reasons why SC and ST women have been nominated in somewhat higher numbers than general-category women. A negative interpretation, consistent with literature from other countries, is that as the pressure to bring more women into politics has increased, parties have consciously chosen to replace male SC and ST candidates with women so as to be able to keep as many general-category male candidates as possible. This may also have happened unintentionally, as SC and ST men tend to have a somewhat weaker position within the party. A more positive interpretation of SC and ST women being nominated in higher numbers is that the political arena in reserved constituencies is somewhat more open to a more diverse set of candidates per se. Whatever the reason, it is important to be aware of such patterns, as it is not ideal that women end up entering politics at the cost of minority-group men rather than majority-group men. It is also important to notice that the main increases in the nomination of women candidates have happened in response to considerable public pressure and discussion about the need to increase the number of women in politics. This indicates that it really does matter to focus attention on this issue. Francesca R. Jensenius is an Associate Professor in the Department of Political Science at the University of Oslo and a Senior Research Fellow at the Norwegian Institute of International Affairs.